The Templaco Carbide Boring Lock Installation kit is a professional quality complete lock installation kit for cylindrical locksets. This kit is supplied with the best Templaco basic door fixture that will adjust from 2-3/8" to 2-3/4" backset positions and for wood doors from as thin as 1" to 2-1/2" thick. Kit includes: three carbide spur bits for boring both edge-bore and cross-bore, sizes are 1", 1-1/2" and 2-1/8". 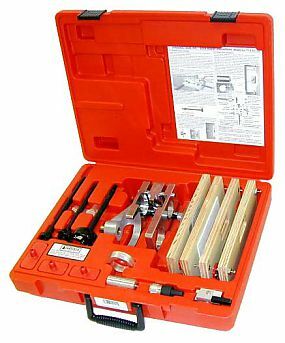 Also included are two complete lock and strike router template kits, Stock Number LS-166A & LS-171B which will provide for the mortising of most all of the popular lockset latches and strikes using your router. To complete the kit we include a 1/2" hex drive quick-release drill adapter to chuck the bits into your drill motor, a 1-1/2" reducer ring to use with the 1-1/2" spur bit, aluminum center marker with a stainless steel point and a spring loaded corner chisel for squaring out the corners on both locksets and hinges. This complete kit is enclosed in a rugged red plastic case with strong latches.